This May, our hometown of Newport, RI is a Host City for the Volvo Ocean Race. In this 2017-18 edition the teams will travel 45,000 nautical miles around the globe. It is the world renown sailing competition's only North American stopover and their second visit to our city by the sea. 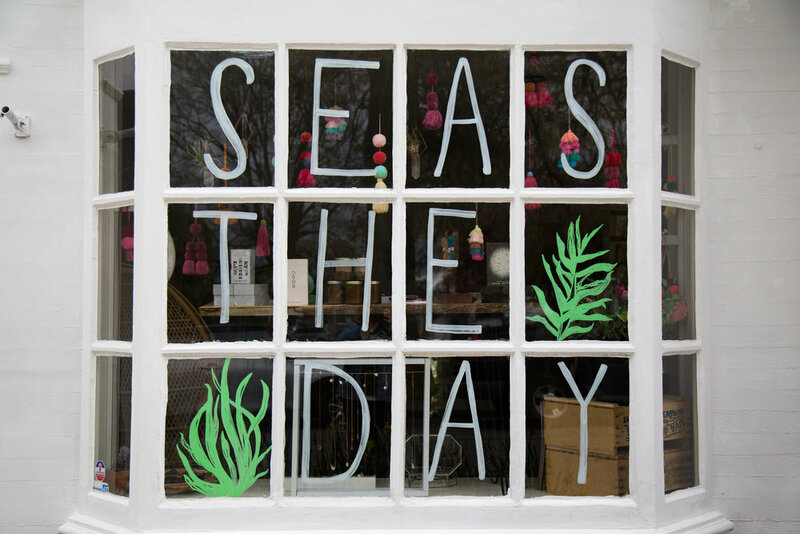 We are so excited to share that we have won first place in the Window Competition celebrating the race in the "Join us for the Clean Seas Pledge" category highlighting the Clean Seas initiative. Our storefront windows were just one of the many reasons we selected 154 Mill Street to be our home and we had such an awesome time utilizing them for this contest. Check out some of the photos of and learn more about the display below. Our gal Sarah got a little punny with our windows that face out to Touro Park, carpe that diem! We collected trash from local beaches here on Aquidneck Island and used the washed up straws and bottle caps to make up our first peace sign. The second peace sign was created using alcohol bottles found on a beach located by a local golf course. We are lucky enough to have Clean Ocean Access, a local nonprofit who does so much for our beaches and coastline here on Aquidneck Island. Be sure to give them a follow @cleanoceanaccess, or visit their website to find out more ways to get involved. We are always down to stand up for a cause and what better cause than mermaids and clean seas? We dressed our mannequin Magda in Novella Royale and Mate The Label, two ethical and sustainable clothing brands we carry in the shop that are made here in the US. Every day is a good day to care about the environment and our oceans. Easy things you can do that make a difference are to participate in local beach clean ups (or do your own like we did), and eliminate single use plastic from your daily routine . We found an astonishing number of straws during our clean up, an easy way to prevent this is to #skipthestraw. We recently purchased reusable metal straws from our neighbors over at Meg's Aussie Milk Bar. The teams begin leg 9 of the race on their journey to Cardiff this Sunday May 20th so if you haven't already be sure to stop by the Race Village located at Fort Adams. There are plenty of free activities and fun for the entire family. For more information on the happenings down at the Fort and around town click here. Good luck and happy sailing to all of the teams participating in the race! Get to know one of the babes behind Bohemian Bias, Brooke! Get to know one of the babes behind Bohemian Bias, Sarah!